This week, DerVVulfman discovered that some members were having problems updating their account profiles, and this because of a glitch with the Country Flags system in use. To resolve the issue, the system had to be reset, thus losing all previously applied settings for every member. But the issue was resolved as Holder popped in to bare witness. Compared to the last couple of weeks, not as many registered members had birthdays this week. But Krazy_Meerkat, RockyRaccoon and lasirice01 had their share of birthday cake. After that, a single cake was given to Rui And this was followed by Parkman202 and wombats enjoying their bit of birthday cake. Comedy and satre appear to be What's on the mind of both DerVVulfman and KDC, though DerVVulfman appears to be going through a real life catch 22 while KDC noticed that the star of Ant-Man has been playing a fifteen year running gag. If you chose to ask DerVVulfman "What Are Youtubing? ", he discovered to be wary of relatives if you were on some pain medication, especially if they mixed Orson Wells with The Walking Dead. 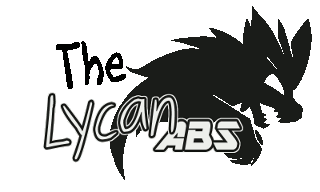 For those wondering What's up with their fellow RMers, DerVVulfman finished the preliminary installation of the Stances system into his Lycan ABS. He admits that it still needs some work. And while reading up on Ruby scripting, kyonides stumbled upon a course that dealt with web and database content, and that it offered a scholarship with paid expenses. Rather than posting his own work in the Maps and screenshots thread, kyonides shared some nighttime city shots from a discord user named ReptaliaCA. You can now get the source code for the latest version of HiddenChest RGSS Player Executable courtesy of kyonides. And he, of course, reminds everyone that it was built on Linux with cmake and g++, and made both the 32 and 64-bit Windows versions with cmake and mingw64. This week, kyonides worked continuously upon KRumors, and visited upon us four sets of updates. His first visit discussed how stories are now displayed. His second visit informed us that one can now flip through pages in the stories section and how active actors may be given access to rumors by way of script calls; a terciary feature to allow active players learn some rumors while those they send away do most of the information gathering. His third visit announced that one can read the thoughts of the Hero regarding a rumor lest they not been configured. And kyonides's fourth announced that his system is relatively finished. But if you have any suggestions for further improvements or additions, feel free to give kyonides a shout. There is a new work in progress among Holders Animated Battlers as Holder began to craft a new floating enemy that has a glistening slime appearance. And I should just add that KRumors XP had been updated a fifth time, thus reaching version 1.0.8 in the process and featuring the M+ 1c font now. 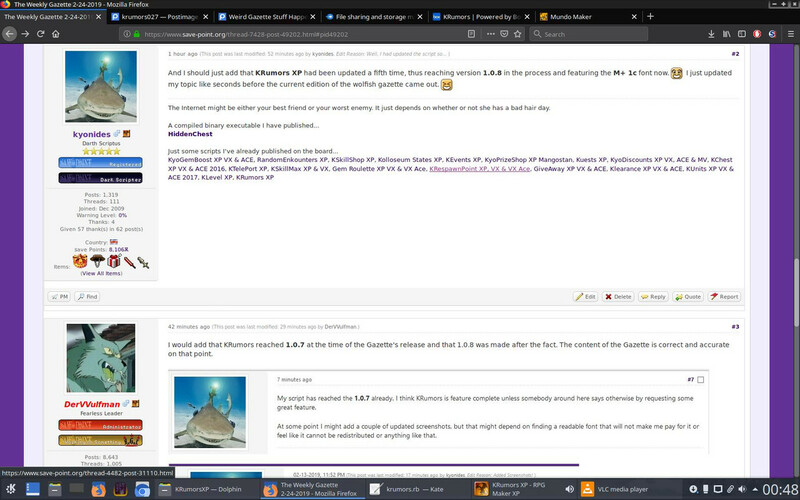 I just updated my topic like seconds before the current edition of the wolfish gazette came out. I would add that KRumors reached 1.0.7 at the time of the Gazette's release and that 1.0.8 was made after the fact. The content of the Gazette is correct and accurate on that point. Please, I saw you posted your update just before the Gazette's release. I screencapped it right then and there. And you only made version 1.0.8 just 20 minutes ago... roughly one hour after posting. Hey, I'm not blaming anybody! I just updated the script version wherever I could, but omitted to do it in the latest bump post.